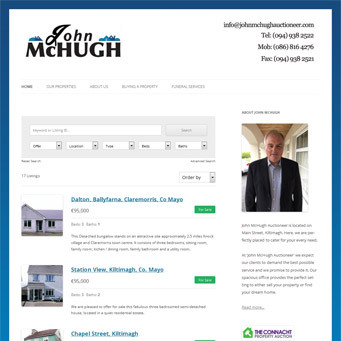 John McHugh is an estate agent and auctioneer based in Kiltimagh, Co. Mayo. He had a dated, non-responsive site built originally in Joomla nearly 10 years ago that really wasn’t fit for purpose in the age of smartphones and tablets. I was asked to undertake a re-vamp of the site into a new, easily-maintaineable catalogue of his properties that could be browsed on any device. To do this I chose to go right back to the start and switch platforms entirely to WordPress. The result is a clean, simple site that John is able to maintain himself.